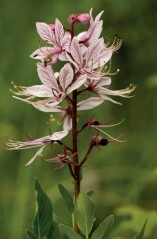 An­ upright, ­shrub-like­ plant, ­especially ­on­ steep­ slopes­ with­ scrub, with­ leaves ­in ­3-6­ irregular­ pairs­ and­ conspicuous,­ dark-veined pink­ ﬂowers ­in­ long­ clusters. Superﬁcially­ orchid-like, with­ crimson ­ﬂowers­ in­ long, loose­ clusters, ­a­ showy­ plant ­forming­ patches­ in­ meadows­ and­ pastures,sometimes­ ﬂowering­ well­ into­ autumn. 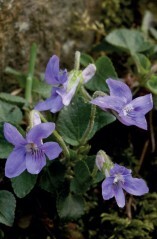 Only conspicuous in early spring, alow-growing, tufted plant with long-stalked, heart-shaped hairy leaves and unscented, pale or dark violet flowers. 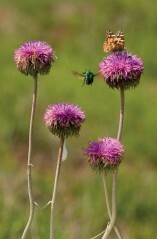 A ­tall elegant ­thistle ­with ­cobweb-like hairs,­ upright ­stems­ that are ­leaﬂess ­in ­the upper­ part,­ and ­large ­solitary ­reddish-purple ﬂower-heads­ in­ early­ summer. 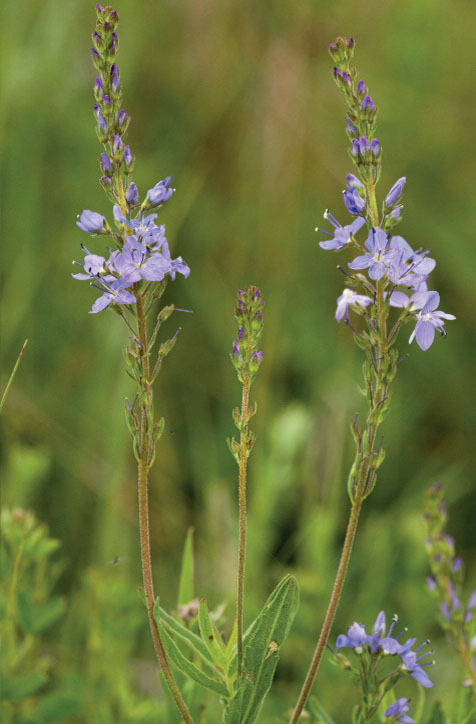 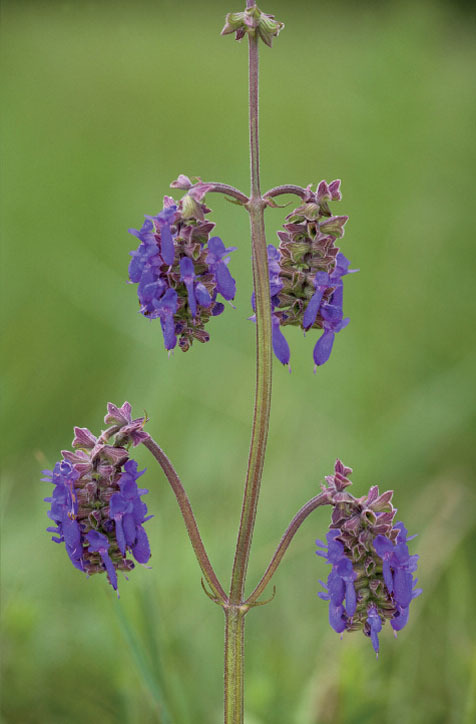 A ­rather­ slender,­ erect ­plant ­with­ ﬂower-spikes ­in­ pairs,­ mostly growing in ­pastures,­ ﬂowering­ in early ­summer;­ the ­similar ­but smaller ­Veronica prostrata ﬂowers­ in­ spring. 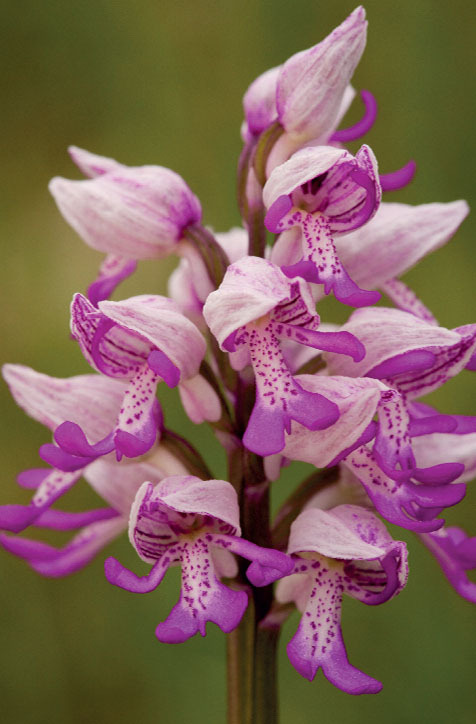 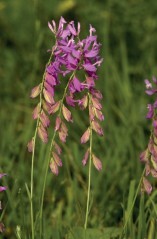 A robust, upright orchid, with conical or cylindrical purplish-pink flower-spikes from late spring; the broad, pale green leaves are oval and al way sun spotted. Steep,­ south-facing,­ often­ in large numbers,­ ﬂowering­ in­ early summer;­ the­ distinctive­ nodding­ violet ­ﬂower-heads­ become­ upright ­as ­the­ seeds ­grow.